Patrick Robinson scores a touchdown after a first-quarter interception in the NFC Championship Game at Lincoln Financial Field. 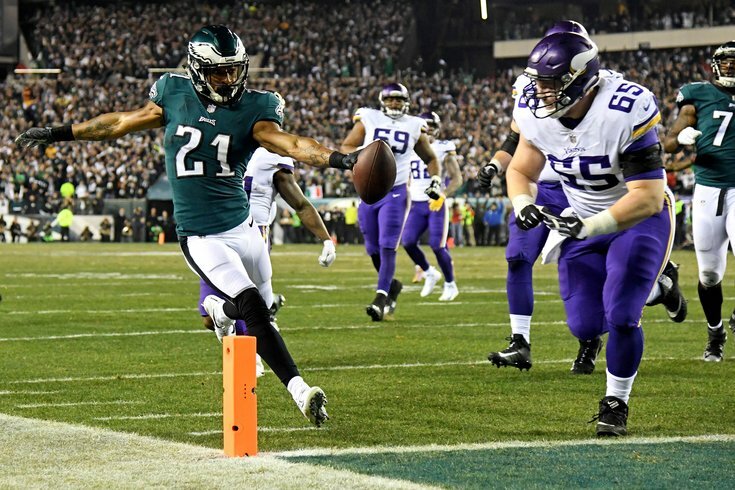 After taking care of business last weekend against the Atlanta Falcons, the Philadelphia Eagles are back in the NFC Championship Game for the first time since the 2008 season, and their opponent is the Minnesota Vikings. The winner will get a date with the New England Patriots, who came from behind to beat the Jacksonville Jaguars, 24-20, in the AFC title game. The Vikings are known for their No. 1 ranked defense (No. 2 vs. the run, No. 2 vs. the pass), and an offense led by journeyman backup quarterback Case Keenum. In our five matchups to watch when we Eagles have the ball, we noted that the Eagles must find a way to run get their rushing attack going to take pressure off Nick Foles. In our five matchups to watch when the Vikings have the ball, we pointed out the major advantage the Eagles' defensive line has over the Vikings' offensive line. That is a matchup they must dominate. The Eagles have weathered devastating injuries all season long, most notably to Carson Wentz, Jason Peters, Jordan Hicks, and Darren Sproles. However, their current injury report includes just one player, Dannell Ellerbe, who is listed as questionable. The Vikings, meanwhile, list four players on their injury report. All but one of them are expected to play. Here's the full Eagles-Vikings injury report, with analysis. It may have been noted a few times this week that the No. 1 seed Eagles come into this matchup as an underdog for the second straight week. There was something about dog masks, I think. Has anyone read that? Well anyway, the Vikings are favored by 3 points. Here's a roundup of local, national, and Minnesota-based picks.